We’ve got a lot of Valiant news this week. 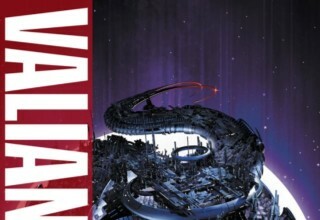 New Valiant series have been announced and previewed, UNITY’s conclusion announced, and two new comics make this week a smashing success for Valiant. First I’d like to talk about two of their upcoming series, WRATH OF THE ETERNAL WARRIOR and THE DEATH-DEFYING DR. MIRAGE: SECOND LIVES. WRATH OF THE ETERNAL WARRIOR is set to feature Gilad, The Eternal Warrior (naturally) as he navigates a terrifying alien landscape in the wake of BOOK OF DEATH. We’ve seen a future version of Gilad off-world in IVAR, TIMEWALKER but this series looks like it will explore the hero’s off-world adventures to a much greater extent. 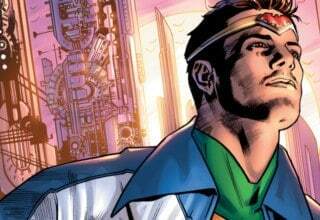 Robert Venditti has developed a great character with Gilad, and testing him by throwing him on another planet is a fantastic way to disrupt a character so connected to the Earth and its history, and hopefully explore his inner workings as he has in the past. 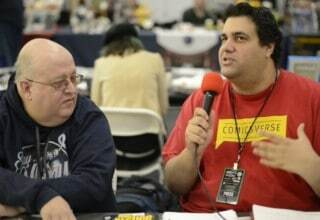 CHECK OUT: Sean’s interview with Unit 44 writer Wes Locher! The released art shows delightfully over-the-top action by Raúl Allen, with beautiful clear inking and extraordinary terrain. I’ve praised Allen’s work in the past, and this looks to be more of the same lush artwork. 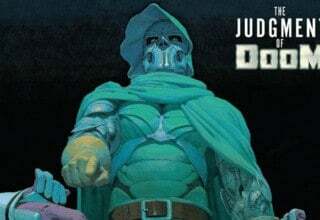 I’m exceptionally excited to see his work on an ongoing comic! 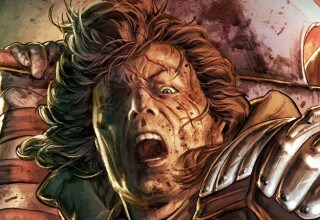 WRATH OF THE ETERNAL WARRIOR #1 comes out in November, and it’s already one of my most anticipated titles of the fall. THE DEATH-DEFYING DR. MIRAGE: SECOND LIVES looks great as well. The Drs. Mirage, Shan and the returned (though still ghostly) Hwen, will return in December in a new miniseries from Jen Van Meter and Roberto De La Torre, the same team that brought you last year’s excellent reinvisioning of the property. Of the plot, Jen Van Meter says “This is a comic book about a kind of funny, but bad-tempered gal and her ghost husband fighting ghost crime and hanging with their witch friends and being awesome.” If it’s anything like the first series, which I covered in my Valiant recap, it’ll be just as fantastic. I can tell by the cover art already that it’s going to impress! 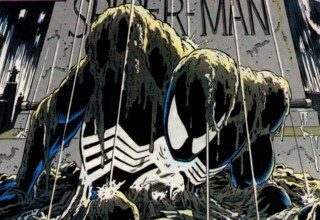 Van Meter’s handle of these characters is emotional and their relationship is quite deep, especially for only four issues of content, and this upcoming series should only see it grow further. We clearly have a great slate of Valiant titles coming up in the next few months, but today’s releases are great as well! NINJAK continues to impress as he hunts down the Shadow Seven, while UNITY wraps up (apparently) one of its final arcs on an emotional note. I’m really digging the varied approach to Ninjak’s battle with the Shadow Seven. 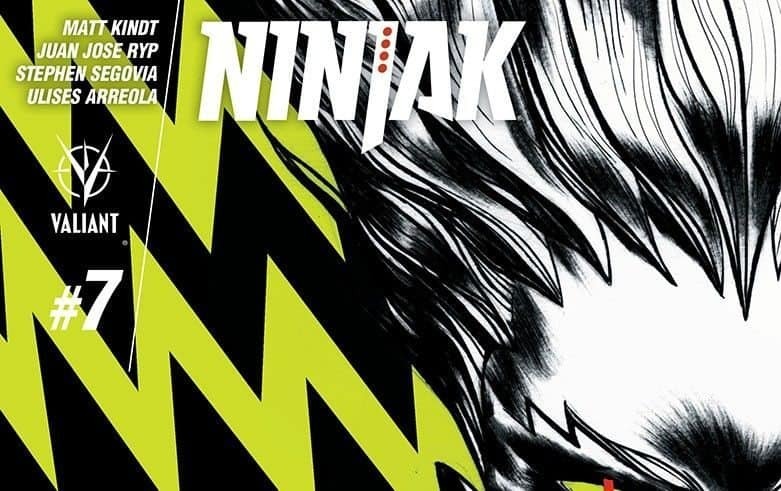 Following the book’s first arc, Ninjak has taken control of the black market weapons business Weaponeer, and has used his position to take out two members of the Shadow Seven—notorious crime lords—with the other five on his list. 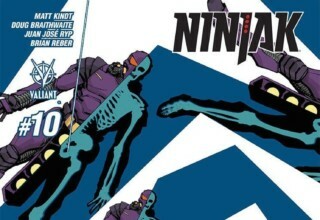 Issue #7 begins in medias res, as Ninjak confronts Sanguine, third on his list. Much of this issue is devoted to developing Sanguine’s backstory. After a terrifying childhood, she was rescued by Kannon (of the Shadow Seven) and put on the path of becoming a surgically and possibly mystically enhanced supervillain. Sanguine’s youth and training seemed a bit extraneous to me at first, but the backup reveals that she and Ninjak attended the same mysterious monastery to build their abilities. Their divergent experiences tie together by the end of the book and suggest some interesting revalations about their characters, and the dangers of Ninjak’s quest to take down the Shadow Seven. He’s going in too deep, and it’s becoming increasingly dangerous. READ: Tons of rare Neil Gaiman books! Check out what we think of them! Juan José Ryp and Ulises Arreola deliver another great issue, as the art is particularly horrifying, thus enhancing Sanguine’s menace greatly. Though I prefer Raúl Allen’s art, I think that Ryp and Arreola fit the mood of Sanguine’s backstory and the resulting bloody confrontation with Ninjak. Sanguine looks genuinely terrifying as she tangles with Ninjak, and she is a remarkably different kind of foe than the other members of the Shadow Seven that we’ve seen so far. Stephen Segovia’s backup reminds me a lot of MASTER OF KUNG FU, perhaps due to the subject matter, and that’s certainly never a bad thing. Arreola gives the backup nice continuity with the main story, though the pencils are different enough to signal two very divergent times in Ninjak’s life. Matt Kindt is having a great week; first with NINJAK, who also makes an appearance in the end of the War-Monger arc in UNITY. Kindt is consistently, along with Venditti, one of the strongest writers Valiant has, and it’s a pleasure to see two comics in a week. This issue, the conclusion to the War-Monger arc, is quite a bit different than the others in the arc, much to my pleasure. Though I did like seeing different eras of Unity assembled as War-Monger told her story of how she defeated them, it grew a bit tiring. The flashback in this issue details the formation of the current Unity team through the perspective of Anchor, the POV character who is tragically tasked with ending War-Monger’s millennia-long raign of terror. War-Monger confronts Neville Alcott, Unity coordinator, while he stalls for the arrival of X-O Manowar. X-O’s confrontation with War-Monger is quite interesting. 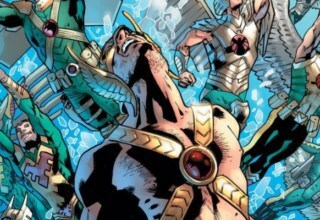 X-O is familiar with immortals, having a strong respect for Gilad (The Eternal Warrior) and his longevity and position as king of his people has changed his viewpoint considerably from his introduction. The king’s confrontation with War-Monger is more verbal than physical, a welcome change to a superhero comic (as Valiant does). 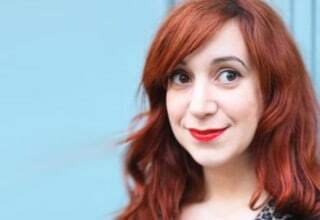 LOOK: Our retrospective on SCOTT PILGRIM! War-Monger eventually encounters the combined might of Unity, including the newly-introduced Anchor, who was unfortunately brought in just to die, sacrificing himself to ensure that War-Monger would not threaten the world again (for quite some time, at least). This sacrificial lamb type character has never been my favorite story element, but Anchor’s story here is presented very well. Jose Luis and Andrew Dalhouse’s art (along with several inkers) is effective, though not particularly notable save for one great scene of Unity standing together against War-Monger. Sadly, it seems that Unity’s run is about over. Valiant announced yesterday that Unity will be ending with issue #25, which is a big humor spectacular. With James Asmus writing alongside Matt Kindt and several comedians, it should be a great way to welcome whatever’s next into the Valiant Universe. Jeff Lemire’s wonderful BLOODSHOT REBORN continues with a brand new arc in issue #6, featuring the much-anticipated debut of Butch Guice on art. 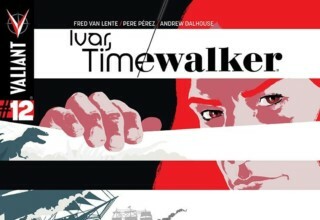 IVAR, TIMEWALKER #9 begins a new arc as well, dealing with the fallout of the last issue, and RAI #10 promises to examine the titular hero’s recent fall from Neo Tokyo to the dead husk of Earth. Join me then for recaps on those and any other Valiant news next week!